This photo is from my buddy Chris who lives in the Tampa area. 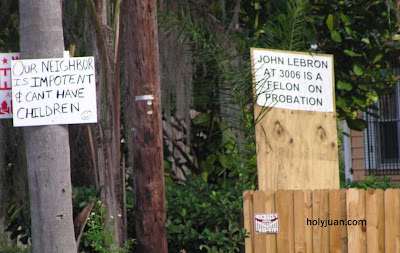 About six weeks ago, three blocks from his house, the sign on the right popped up in a yard that said "John Lebron at 3006 is a felon on probation". 3006 is the address of the house next door. About three days later, a crudely drawn sign appeared in the yard of 3006 that said "This is true. I was a drug addict, but have been saved by Jesus Christ, my Savior". 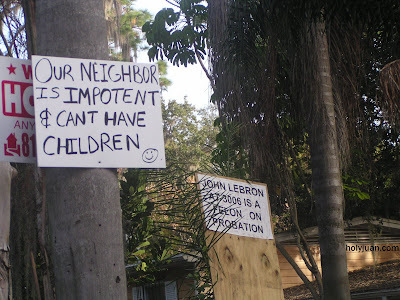 That sign lasted only a few days and was eventually replaced by the sign you see here on the left which reads "Our neighbor is impotent and can't have children". The smiley face really sells it. That's the Christmas spirit!! Love the smiley. Nothing says class like a sign on a piece of plywood leaning against a fence. It;s nice when neighbors know each other and get along so well. WHY would anyone fake that?? Whenever somebody posts a picture that they think is interesting or amazing or incredible, after a few comments someone will simply post "fake". It doesn't matter what the subject of the picture is or whether it's real or not. The post is made because "that's the way it's always been done". They both must have hearts full of Jeebus' love. I wish both parties well and wish that people will grow up and become adults. This is almost like eBay where both parties agree on removing the negative feedback.